Material of Construction: Steel. Made in USA. Front Wheel Size: 12". Front Wheel Type: Pneumatic. Powered/Manual: Manual. Agency App/Cert: None. Cubic Ft: 16.03. 13" deep x 17.5" x 0.25" thick tapered nose plate. 1" heavy duty Sch- 40 pipe frame. Easy grip continuous handle frame design. 3/4" axle with 8" x 2" cast iron center moldon rubber wheels. Wheel guards. Handle Type: Continuous Handle. Floor lock: None. Capacity: 800. Dimensions: 20.5" W x 53" H x 20.5" D.
This is a well built piece of equipment. I have been using the heck out of it since I got it. This is built to last and it works great. I am very pleased with it. 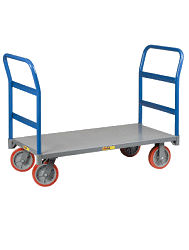 Much better than the HF type hand trucks out there.